How often are you taking them out of the tanks and handling them? It is possible that Sterling only feels secure by being active at night when he doesn't feel threatened. Both corns are relatively young, and with handling may feel more secure. I have 4 lavenders and 2 are always out of their hides when I enter the room, the other 2 don't come out of their hides unless I'm feeding them. You don't need to change anything, just work with Sterling so that he feels confident that you mean him no harm. I make sure to handle each at least once a day, duration depends on their behavior, but only on the unstuffed belly days. Yeah once Sterling is out there are no issues, its just the extended hiding that was worrying me. Out of my 6 corns, we had one that would almost never use her hides and was always out in the open and one that would only come out of his hides during the day to eat. The other 4 were somewhere between the two and each had its own personality. I wouldn't be too concerned with it as long as they are both eating, growing, and shedding regularly. snakes tend to hide more before and during a shed. I have found that some of my snakes seem most active LATE at night-- like if I am up at 2 or 3 AM they are cruising. Others are more active and energetic at earlier hours. Probably just a snake personality thing. As to your comment about a weight chart. This is an excerpt from another site regarding weight and feeding. It's the Munson Method. Personally, if your snake is not overfed, I would see no reason for it to be overweight. Note: Adult females are fed more frequently than adult males (especially following brumation). Females are fed every 6-8 days; males are fed every 7-14 days. This is by no means scientific, and not all corns will cooperate 100% with the schedule. The weight ranges I gave for the prey and snakes are approximate. I'm very consistent in my feedings. Some people feed every Saturday, for example. If they get a refusal, the snake has to wait for the next Saturday to get another shot. I don't do this. If a snake refuses today, he'll get another shot in two days. When quoting the Munson plan, I am quick to remove "Jumbo Adults" from the list. 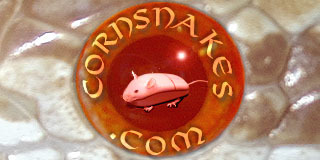 Hefty retired breeder mice make for fat corns just as small rats might. Even my post-lay recovering females get rat pups at best. If I understand your question, you are asking if there is a chart which shows ages and estimated weights. For example, a typical hatchling usually weighs X, a 6 month old weighs X, a yearling weighs X, and so on to adults. I have never seen such a chart, but perhaps one of our members has, and can point you in the right direction.